Patrick Kavanagh, Geoff Park and Bronwyn Silver are holding a photographic exhibition at the Newstead Railway Arts Hub starting on Saturday December 2018. One of the exhibition photos by Patrick Kavanagh. 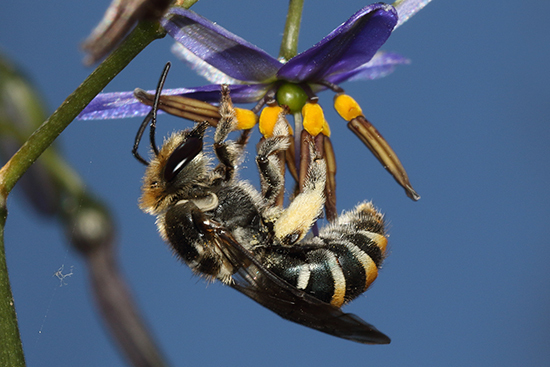 Lipotriches Bee with Black-anther Flax-lily. The expression “taking photographs” is a curious and revealing usage. In English, we don’t “make” photographs, we “take” them. When photographing nature – wildlife, plants, landscapes – it can seem that the photographer “captures” a beauty already there, taking something that belongs to the subject, but without diminishing the subject. Bronwyn Silver, Geoff Park and Patrick Kavanagh roam the goldfields of Central Victoria, stealing images of the beauty they find. Birds, mammals, plants. Not even mosses and lichens are safe from their pilfering ways! While the targets of their larceny are unaffected by the process, these thieves have been profoundly altered by the images they’ve stolen from the wild, seeing more deeply into the wonders of the natural environment. They are happy to share their bounty at Newstead Arts Hub this December. Open 10am – 4pm on the first four weekends in December: 1st & 2nd, 8th & 9th, 15th & 16th, 22nd & 23th. And a reminder that the FOBIF ‘Creatures’ photo exhibition is on at TOGS till 29 November.